So you've got a new fourth-gen Apple TV. Great! Now it's time to stock up on movies, TV shows and apps. Unfortunately, the Apple TV doesn't have the easiest-to-use keyboard layout, and using the remote to enter long passwords can be both time consuming a bit frustrating, especially if you buy a lot of content. 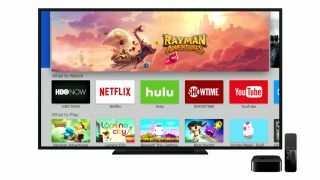 However, with a little adjustment to your settings, you can make purchasing on the Apple TV easy, but also still secure by using a PIN number instead of the traditional full Apple ID password. Continue reading and we'll show you how it's done. 2. Navigate to Accounts > iTunes and App Store > Password Settings. 3. Set "Never" for the Require Password option. 2. Navigate to General > Restrictions. 3. Ensure that Restrictions are turned on and set a PIN code. 4. Choose the "Restrict" option for the Purchase and Rental setting, and for the In-App Purchases setting. Once these two settings have been applied, then your Apple TV will be able to make purchases using a simple 4-digit PIN code instead of your Apple ID password, making purchases still secure from kids and visitors, but also easy to use for authorized purchasers. When you attempt to purchase iTunes, App Store, or In-app Purchase content, simply enter the 4-digit PIN code that you set up when enabling restrictions on your Apple TV.